Oberon (Peter Corboy), the king of the fairies, and his queen Titania (Martha Breen) are in dispute. They have fallen out as Titania refuses to meet one of her king’s demands. He seeks to punish her for her small crime. To achieve this, he sets Robin “Puck” Goodfellow (Amy Conroy) off to find a flower with magical properties. This flower will make Titania fall in love with the first creature she sees once she awakes. And so begins a night of magical happenings in a forest outside Athens. The play features a number of different sub plots in which we get to see unrequited love, the faerie folk and also a play within the play. This is one of Shakespeare’s best loved comedies and was written by the Bard in 1596. 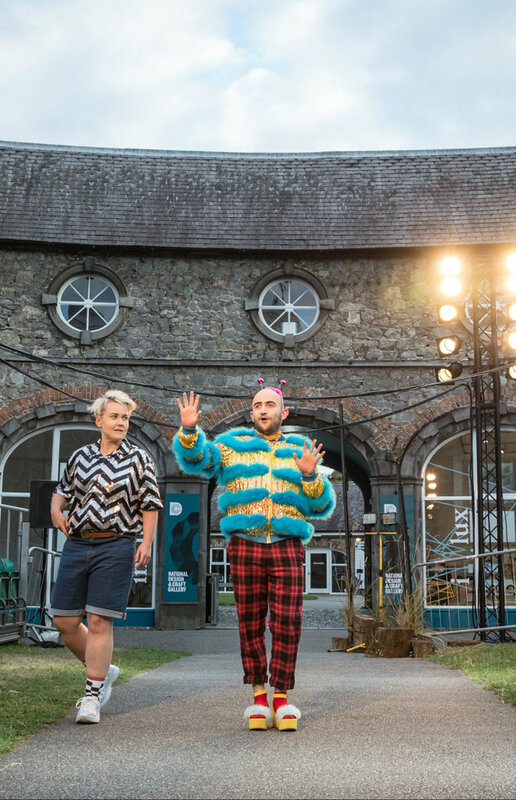 This new production by Rough Magic uses the skills and athleticism of the young cast to create a memorable evening in the Castle Yard, Kilkenny. The production takes place outdoors which adds to the excitement of the event, but also leaves the audience exposed to the elements. Despite the relative heat of this summer, I’d recommend you dress warm! The production does not take a particular spin on the play but does indulge itself in some lavish and elaborate costumes created by Katie Davenport. The fairy folk are a particular highlight, dressed in leather and plastic, they look like an androgynous glam rock band or extras from the Rocky Horror show. 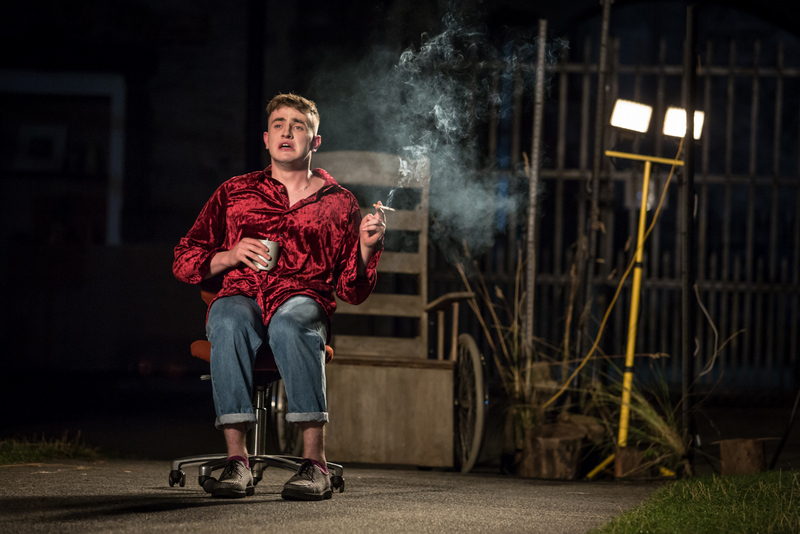 The production starts in daylight but it slowly fades over the course of the evening, which is where the lighting by Sarah Jane Shiels comes to the fore. The production uses minimal props and the lighting is often used to change the setting and it is impressive throughout. The performance space is central to two banks of tiered seating. The audience can see the actors ‘off stage’ changing costumes and also running laps around the space, a device which works surprisingly well. 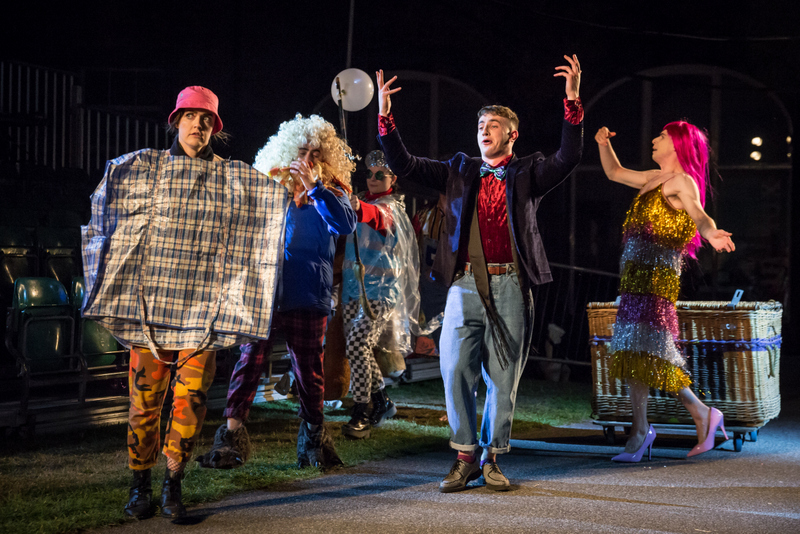 The young group of actors do not contain any big names and none of them would draw an audience by themselves, but the ensemble put life and humour into the play, and create a sense of wildness on stage. As with any production this inventive, not all elements work, including a questionable final song, but the positives far out weigh the negatives. This is one of the most imaginative productions of the year.